When designing our Kee Walk standardised step-overs, we wanted to make them easy to put together and maintain, while keeping you perfectly safe at the same time. We pre-assembled sections of the system to help reduce installation time and shipping costs. While we do provide step-by-step instructions with each step-over we send out, we think that this step-by-step guide on how to install the system will help you understand the product better. This guide focuses on a step-over designed for use on membrane, asphalt or PVC roofs and includes large PVC feet. The step-overs suitable for concrete floors have galvanised steel feet. Before starting to put the step-over together, make sure you received all relevant components. A complete list of all parts is provided with the delivery. Please note that the step-overs suitable for concrete roofs will have different components compared to the ones suitable for membrane, asphalt or PVC roofs. To make the assembly easier, we suggest laying out all the components and sub-assemblies as shown above. Take both back upright assemblies to the position of the obstacle, along with the weighted foot assemblies. Starting with the left-hand side back upright assembly, up end the upright such that it is orientated with the 10-7 fitting at the bottom. Pick up the weight cross rail, and feed through into the lower fitting of the upright, and slide the right-hand side towards the left. Insert the cross rail at mid-point to connect both uprights together. Insert the 74-7 fittings into the 440-7 weights and add the weights to either end of the tube, ensuring the weights are inserted fully. Tighten the 74-7 grubscrews to 39Nm. Manoeuvre the assembled rear upright into position at the point of install. Tighten all grubscrews to the required 39Nm torque setting. Repeating of step 3 enables the other side of the uprights to be built, which in turn allows the next phase of the build to commence. Take the bridge platform subassembly framework and insert into the 326 fitting present on one side of the rear uprights, followed by the handrails into the fittings further up the upright. Bring the opposite outer leg assembly to meet the platform, and locate tubes from bridge module subframe into the slope fittings present on the uprights. Add the Kee Walk bridge tread assembly to the substrate, ensuring it is centered left/right and front/back and fix into place using the 105-7 fittings to the underside and securing in place with self-drilling screw. 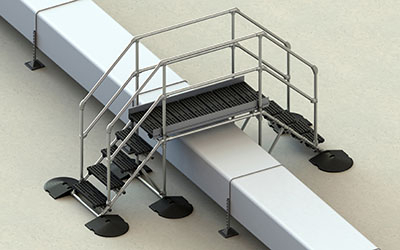 Take the stair tread assembly module to the area in which it is to be installed, and collect the 440 weights, cross tubes and relevant fittings. Insert the lower weight cross tube into the lower 10-7 fittings sliding from left to right; space the tube such that an equal overhang exists both sides and tighten grub screws on 10-7’s to 39Nm. Locate cross brace tube into C50-77 fitting and tighten. 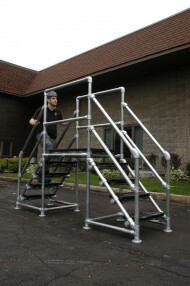 Take the pre-assembled stair module and move towards assembled bridge platform in previous steps. Locate upper tube from staircase and brace tube in the correct orientation to meet the corresponding tube sockets in the lower 29-7 and upper 326-7 Fitting. Starting with the upper tube, manoeuvre the lower tube down towards the stair assembly and lower the staircase such that the upper tube can be inserted into the 326-7 fitting. Before fitting fully, locate lower tube into 29-7 fitting. Push both tubes on both sides home, ensuring staircase is square. Lightly tighten grubscrews to locate stair assembly into place. Insert the 74-7 fitting into the weights and slide the weights onto the end of the tube ensuring that they are fully inserted. Double check for location, once happy tighten all grubscrews to 39Nm. Repeat the procedure for the other staircase. Take the forward assembled uprights and insert into the 29-7 fitting present on the stair cassette and loosely tighten the fittings. Starting on one side, insert the two inclined hand rails into the 326-7 fittings present on the rear upright, and manoeuvering the front upright forward insert both rails in the 29-7 and the 55-7 fittings, move the upright back to its upright position and loosely tighten. Using a spirit level, ensure the forward upright is plumb and level in the X and Y plane, once level, tighten all grub screws to 39Nm. Repeat for other side of staircase, and then repeat the entire procedure for the other staircase. Locate toe board inboard of bridge platform and pick the TBFP1 fixing packs and TB3-7 toe-board fixing clamps. Insert the M12 bolts into the extruded channel, and locate 1 bolt either side of each upright as shown in the illustration. Locate the TB3 clip onto the bolts, fits the nuts and washers. Level the toe board and tighten the fixings to 25Nm. With the platform now fully assembled, check the tread rise (distance in height between treads), going, and angle. Starting at the bottom tread, measure the rise between the treads ensuring that there is no more than 5% difference between any two Tread heights*. Looking from above, there should be a minimum of 10mm overlap on the treads*. Starting at the top tread, and using a spirit level, ensure that all treads are level left/right and forwards/backwards. If an adjustment needs to be made in the fore/aft level simply slacken the grubscrews on the 45-76 and 10-76 on both sides, adjust tread to correct, level angle and retighten. If adjustment needs to be made to accommodate the 10mm overlap between treads, simply undo the 13mm nuts holding the tread extrusion to the 199 fitting and adjust, ensuring that they are retightened on completion. Starting at the lower left staircase, working from the lowest point, systematically tighten all grubscrews with a calibrated torque wrench and indelibly mark the grubscrew with a paintmarker once at torque. This performs two functions, it lets the installer know once a grubscrew has been tightened, but also on annual inspection allows the inspector to see if a grub screw has come lose and needs attention. The same principle applied to all other fixings, using 18Nm for all 13mm headed fixings, 25Nm on toeboard M12 fixings and Tek Screws to be tightened until a compressing of the Foam backed washer is observed. It is IMPERATIVE that ALL grubscrews and fixings are checked on the ENTIRE assembly and torqued up to the correct torque Value and marked!! 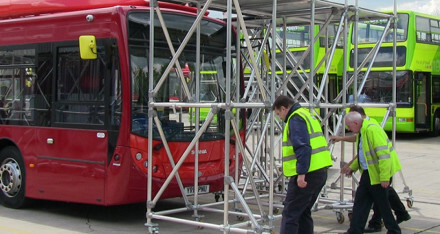 Reading Transport needed a way to service their Scania-ADL gas powered buses, so we designed a mobile work platform that worked best for them. 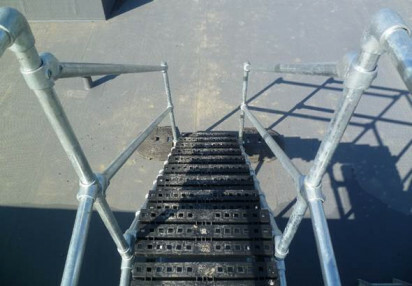 These customised roof platforms are perfect for providing safe access for your workers so they can perform essential maintenance where the roof may change in heights. 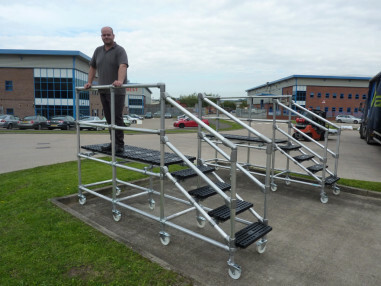 A customer asked us to design a raised access platform to enable workers gain access to the side of vehicles. See how we did.